First off, as promised this major-label debut (actually their third full album) is not a sell-out in any way, shape or form. 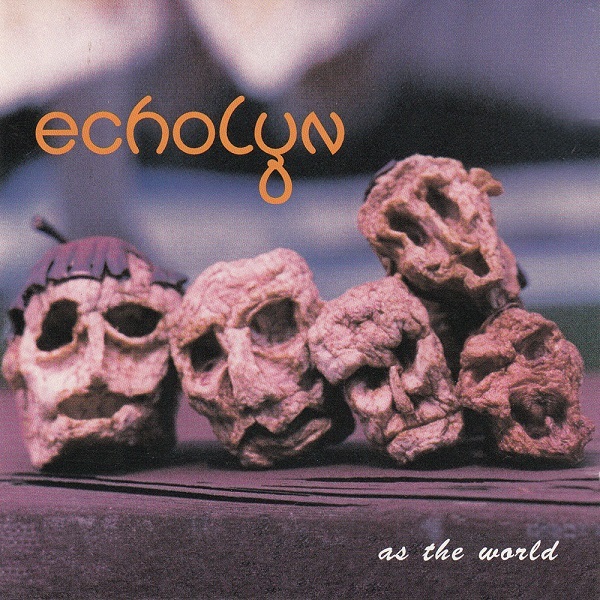 Echolyn have maintained the essence of their sound as defined on the previous two albums and have undergone significant metamorphosis as well, some changes for the better and others somewhat less satisfactory. The most notable of these being the drastically increased share of vocals; prepare your ears for 14 of 16 tracks chock full of two and three-part harmonies, many of which are admittedly difficult to sing with their dissonant and advanced voicings and cross-overs. In fact there is so much multi-part vocal that the traditional solo lead voices of Brett Kull and Ray Weston seem strangely alone when they take the fore. The band is tighter than ever, with the most impressive performances being turned in by drummer Paul Ramsey and bassist Tom Hyatt. It's their underpinnings on every tune that make this album worth the dough, regardless of your opinion on all the vocals. Unfortunately, keyboard master Chris Buzby and guitarist Kull don't take the solo spotlight as often as they used to, but when they do they really shine. Lyrically, the band has moved away from the more nostalgic and reminiscent approach of their previous efforts for something more generic and less personal and sincere. Of course there are exceptions to this (like "Uncle," "Entry 11/19/93," "The Cheese Stands Alone") but others (like "Never the Same," "Best Regards") are significantly more shallow. The band has made the almost unforgivable mistake of not including the lyrics in favor of a large band photo, but they are available through their management in the form of a book with commentary from band members about each track or over the Internet. Longtime fans will likely have fairly mixed views of As the World, but it undoubtedly ranks as one of the strongest major label releases in over a decade. Hopefully their next effort will push them into more uncharted waters, with a stronger focus on musicianship and interplay and less of a focus on vocal harmonies since they have clearly mastered that element of their music here. Echolyn seems to be intent on making a career walking the line between commercially acceptable album-oriented rock and something a bit more challenging. First off, As the World is much more vocally oriented than their previous releases. There are only two instrumental tracks, both of which are less than a minute long. Three-part vocal harmonies are present in most of the pieces. Combined with the standard verse-chorus structure that pervades these tracks, the vocals add to the saccharine-prettiness of the music. But then again, some of the three-part harmonies are quite difficult, with each vocalist singing different words, and all three trading off harmonies. The vocals themselves may turn some listeners off completely. While lead singer Ray Weston does have a very capable voice, it often sounds strained. Guitarist Brett Kull, who sings backup and lead, almost always sounds strained. While I cringe less at the vocals on this release than some of those on their eponymous debut and Suffocating the Bloom, there still are times I wish they were an instrumental band. Compositionally, we have another mixed bag. Some of the tracks, "As the World" and "The Wiblet" in particular, are quite complex texturally and harmonically (in fact, anyone who enjoys "The Wiblet" should try some Samla Mammas Manna or Magma). Others are very simple (i.e. : "One for the Show," "Settled Land," and "Never the Same") and add little to the album except for accessibility. On the other hand, the band does display a fair amount of versatility, which may endear them to some listeners. Within each track, even the weaker ones, there is usually a fairly interesting bridge or instrumental break. The true ability of Echolyn comes through in these moments. The lyrics are infected with the heavy-handed, preachy sophmoricism that plagues bands like Rush. The words are above-average rock-and-roll poetry, yet they can be touching in their naivety. Overall, this leads to (yup, you guessed it!) an inconsistent album. If I had been let into the editing room for As the World, it would have been about 40 minutes long, with fewer vocals. While Echolyn surpass commercial bands like Rush, Kansas, and Marillion in terms of musicality, they aren't quite up to the level of peak Yes or Gentle Giant. Given that at least one member of the band has been formally trained and is aware of the avant-garde, I hope the band is not afraid to dump their current formula at some point and to explore more Terra Incognita. As it stands, I am disappointed with As the World and enjoy Suffocating the Bloom much more, despite its rawness.